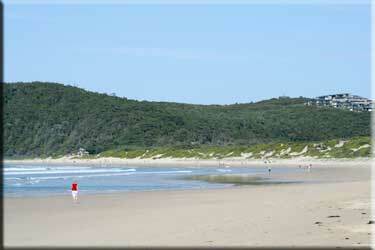 One Mile is a "suburb" of Port Stephens and lies just behind the sand dunes between Anna Bay and Nelson Bay. 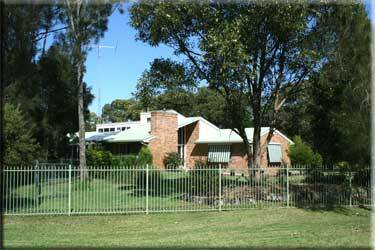 It is a very small community of only about 50 houses, all on about one acre ( = 0.5 hectare) blocs. We are right at the tip of the Tomaree Peninsula and - as the crow flies - about 150 km North East of Sydney (two and a half hours by car) and about 45 mins. from greater Newcastle. Our house is the first one in Eucalyptus Drive and we can walk to the beach in less than 5 minutes when we climb the dunes just across the road. Shopping we do mostly in Salamander Bay - about a 10 minutes drive from home. The Salamander Bay shopping centre was extended and totaly refurbished in 2005 and the range of shops including a large K-Mart - meets 90% of our normal requirements. For more extensive shopping and specialties we go to greater Newcastle (Kotara or Charlestown) and - very occasionally - to Sydney. 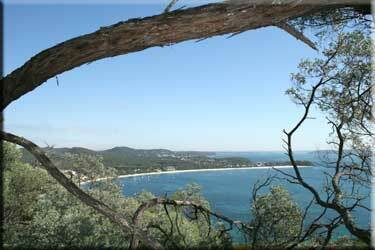 View of Shoal Bay from Tomaree Headland. Nelson Bay is also less than 10 minutes driving from our home and is steadily developing as a major tourist center with many new blocs of holiday units. When we arrived in 1999 the winter season was very quiet but nowadays (2008) there is activity all year round. Many overseas visitors come to watch the dolphins and - from May till September - the many whales that are either on their way to their breeding grounds off the Queensland Coast or on the way back to the southern oceans. If you want to know more about the area and its holiday potential, please visit the Port Stephens Tourism Website. More pictures of our beatiful area compiled into a small slideshow. To view click the button.